The main objective of this subproject is to derive long-term glacier mass changes based on remote sensing data. We will mainly use existing multi-temporal digital elevation models to obtain the mass changes for the period ~2000 – 2015 and two subperiods therein. For validation, calibration and uncertainty estimation high resolution stereo imagery, ICESat laser altimetry and in-situ mass balance measurements will be used. An important task is to improve existing algorithms for ICESat data and to acquire new high resolution data in order to test the potential for obtaining seasonal variations of mass changes. For this task, Project P8 will concentrate on the two glacierised critical regions, the endorheic basins of the Tibetan Plateau and the Ganges basin along with smaller catchments within these regions. Derived glacier mass changes will be applied to support glacier modelling and the separation of the glacier signal from the other components of the GRACE signal over glacierised regions. 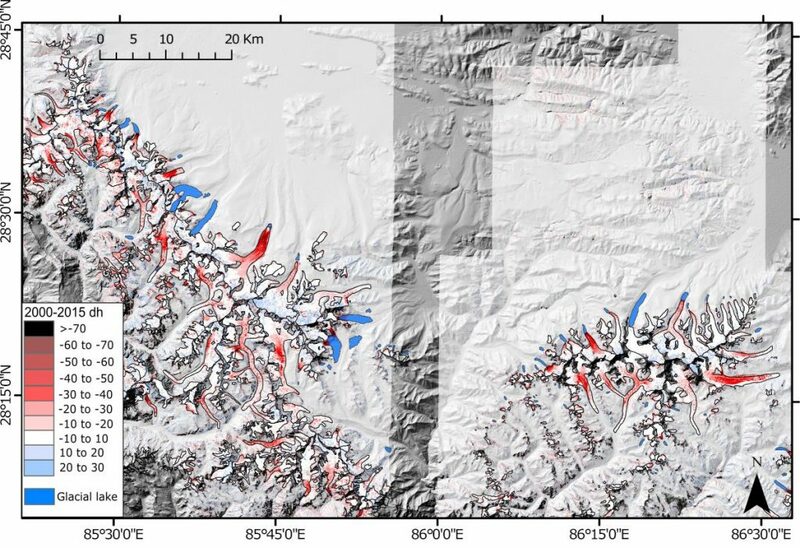 Figure: Surface elevation changes ~2000 – 2015 of glaciers located in the upper Ganges catchment in central Himalaya.